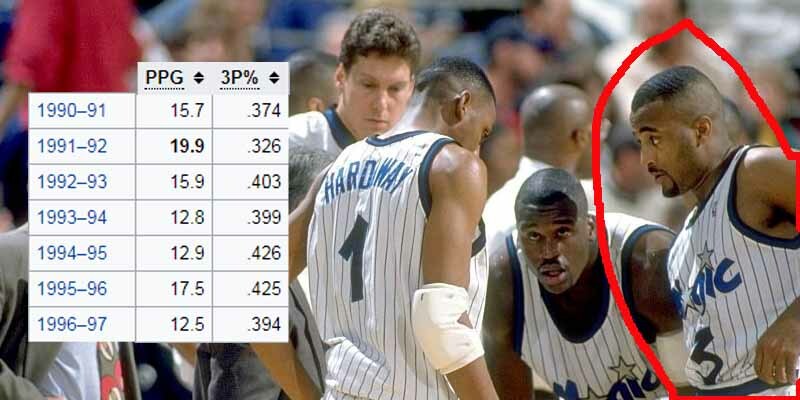 It’s hard to stand out on a team with Shaq and Penny, so the early 90s Magic‘s main perimeter threat Dennis Scott often gets overlooked. Scott put up around 8 threes per game, which is a lot by 90s standards, and converted them at a career average rate of 40%. Scott averaged as much as 20 points per game in only his second season and would lead the league in three-pointers made in the 1995-96 season, converting a career-high 267.